What makes a state? This question has attracted more and more attention in recent years with Catalan's illegal vote for independence from Spain and Palestine's ongoing search for international recognition. And while Scotland chose to remain with the United Kingdom, discussions of independence have only continued as the ramifications of the later Brexit vote begin to set in. As James Ker-Lindsay and Mikulas Fabry show in this new addition to the What Everyone Needs to Know (R) series, the road to statehood does not run smooth. Declaring independence is only the first step; gaining both local and global acceptance is necessary before a state can become truly independent. The prospect of losing territory is usually not welcomed by the parent state, and any such threat to an existing culture and its economy is often met with resistance-armed or otherwise. Beyondthis immediate conflict, the international community often refuses to accept new states without proof of defined territory, a settled population, and effective government, which frequently translates to a democratic one with demonstrated respect for human rights. 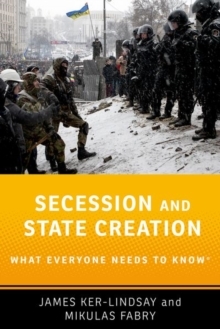 Covering the legal, political, and practicalissues of secession and state creation, Ker-Lindsay and Fabry provide an essential guide to this timely topic.